White Christmas is a psychological suspense drama about a group of eight students and their teacher who are the only ones left at their prestigious school located deep in the mountains during Christmas break when a snowstorm cuts them off from civilization. After all of the students receive a cryptic letter, they soon learn there may me a murderer among them. Trust within the group quickly deteriorates as everyone finds themselves fighting for their lives. White Christmas was a fascinating drama that poses the question, “Are monsters born or created?” When faced with a life or death situation, what lengths would you go to in order to survive? Would you turn into a monster? With these questions in mind, we began our journey with the unfortunate students who found themselves trapped at school. The first few episodes were a tad slow, but they were important in setting up the situation as well as letting us get to know each of our characters and their personalities. But then things get really suspenseful as the students find themselves involved in a game of life and death. Something I found interesting about this drama is that it has a lot of well-known actors in it, but it was an early project for most of them. Because of that, some of the acting is a little stiff from a couple of them, but I didn’t find it to be problematic. I always really like situations where a small group of people get trapped together. And even better when a killer is among the group and they begin to question each other. These scenarios are perfect for highlighting what fear can do to people as well as show how far humans will go to survive. As the group tries to solve they mystery of the letters, they begin to suspect one another. This allows us to dig deeper into our characters as we learn more of their backstories and about their personalities. But things get really serious when people start dying. The students find themselves in a terrifying situation that really tests their trust for one another. Things get pretty intense. Sometimes I enjoyed the cat and mouse type games. Other times, I felt so saddened by what these students were going through. I definitely had a lot of emotions while watching White Christmas. White Christmas does sort of feel like a low budget indie film. But in many ways, I think that helped create a very dry, stark, and lonely atmosphere. I really liked the variety of music choices that were played throughout the drama too. They really set a unique mood. Overall, White Christmas is a very fascinating exploration of the human mind and the lengths we might go to in order to survive. I really enjoyed this dark, desolate little world that we got to delve into. And we are left with some difficult questions in the end to really make us think. We have the first big reveal that the man (Kim Sang Kyung) who found his way to the school after a car accident is in fact a serial killer who escaped. But this killer is actually a psychologist, and he embarks on an experiment of his making to see if the students can be made into monsters. It’s a mixture of sadness and fascination as we watch the students lose trust and fight with each other. Of course, they are terrified. And everyone reacts differently to that fear. Sometimes the students band together in an attempt to take down the killer, but their plans are constantly thwarted. And as he continues his experiment, he plays games with their minds and watches who will turn against each other. There are very sad moments where the students gang up on each other and times where they even lose one of their own. Then there are times of celebration where they think they have overcome the killer. But happiness is short lived as they find themselves right back where they started. Each student was interesting in their own way. Yoon Su (Lee Soo Hyuk) as the sort of zoned out druggie. Mi Reu (Kim Woo Bin) as the wild and adventurous one. Young Jae (Kim Young Kwang) as the bully who is really just a coward. Jae Kyu (Hong Jong Hyun) as the quiet one. Eun Sung (Lee Som) as the girl who can’t live up to expectations. Kang Mo (Kwak Jung Wook) as the boy with a hearing disability always trying to prove himself. And Chi Hoon (Sung Joon) as the intelligent and logical one. Then there is Mu Yeol (Baek Sung Hyun) as the leader of the group. He’s the one who has it all together. He’s compassionate, smart, and is able to bring people together and take charge. Watching him navigate the situation was truly fascinating. There’s a point well into the drama where the monster creation concept is really laid out well. In one instance, we see Jae Kyu become upset that Young Jae would lie to the killer to save himself and jeopardize the rest of the group. He ends up losing himself in this moment and truly becomes a monster at he attacks Young Jae. It was a sad scene. At the same time, Mu Yeol and Chi Hoon find themselves in difficult situation on the cold mountain as they were trying to get help. After a fight, Chi Hoon ends up with a broken leg at the bottom of a steep hill. 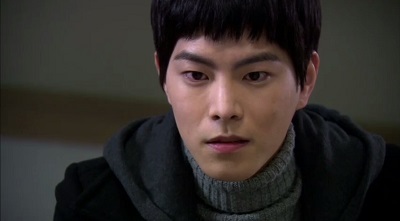 Mu Yeol disappears leaving Chi Hoon at the bottom fearing he has been left behind. But Mu Yeol returns with rope to hoist him up. As Mu Yeol uses all of his strength to slowly pull Chi Hoon up, images of their rivalry and why he dislikes Chi Hoon flash through his head. For a moment, he considers letting go of the rope…a monster was almost born. 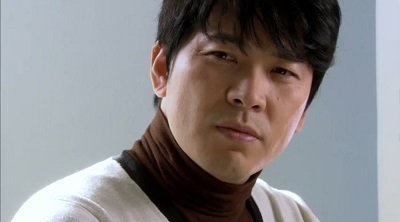 But he finally pulls it together and is able to save Chi Hoon. These two instances were very interesting to compare. After a long eight days with the psychologist messing with their minds, the students do finally get rescued by the police. But the killer escapes, and he continues his game to see if he has created a monster. But his experiment results in tragedy for one student. 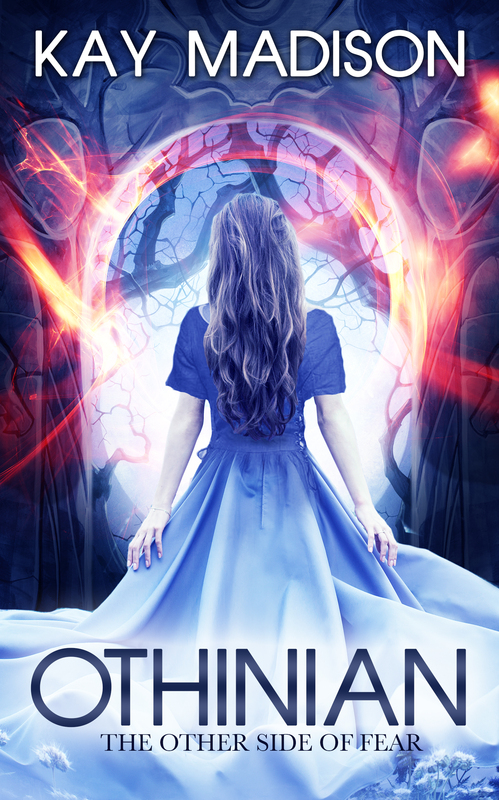 Rather than allowing himself to become a monster, Yoon Su takes his own life. This devastating turn of events triggers something in the remaining students. They take the opportunity to meet with the killer one last time on a rooftop. As the cops approach, they lock the doors and close in on the killer. They then choose to be rid of him for good and throw him off the roof. But just before the killer falls, happiness comes over him as he says, “I won.” He had created monsters. The students lie to the police about what happened on the rooftop to shift any blame away from them. After everything they have been through, they are now bonded together for life. The question is, “Did they become monsters?” What do you think? Click here for more Kdrama Reviews. Copyright © 2015-2016 by Kdrama Kisses. All rights reserved. This website or any portion thereof may not be reproduced or used in any manner whatsoever without the express written permission of the author. Excerpts may be used provided that credit is given to Kdrama Kisses (kdramakisses.com) with clear and direct links to the original content. 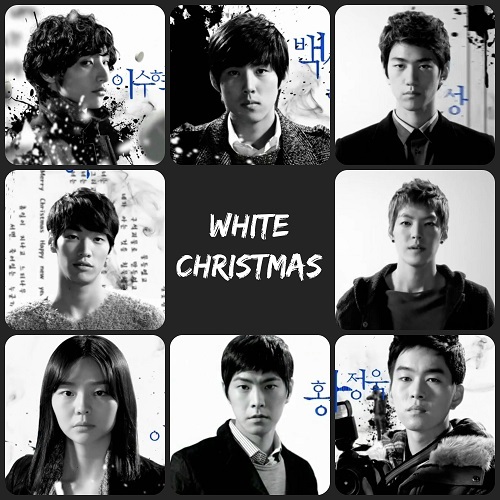 This entry was posted in Reviews and tagged kdrama, Kim Woo Bin, Korean Drama, Lee Soo Hyuk, White Christmas. Bookmark the permalink. I didn’t feel that they became monsters but they think so and that is what matters. Those poor kids were already struggling in various ways and that evil man just pushed them to the brink for his own amusement. I really liked the drama even though some of the youngsters hadn’t yet learned their craft so well they were all giving it their best so it was fun to watch. 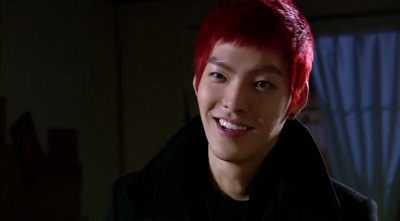 Woo Bin looked amazing with that red hair. Luckily, even though some of the acting was a bit stiff, I think they all did very well, and with the story really working for them, it made it all come together. It was a drama that really makes you think. So sad what all of the kids went through and the choice they had to make. I was so impressed with this drama that I gave it a 9/10. It is amazing that this was the first main character role for Kim Woo Bin, Lee Soo Hyuk, Sung Joon, and Kim Young Kwang, and second for Hong Jong Hyun. The other two male students had been child actors. I think it is also interesting that Lee Soo Hyuk, Hong Jong Hyun, and Kim Woo Bin worked together in Vampire Idol that same year. All five started out as models and have remained friends in real life. If I were only rating the last five eps, I would definitely give it a 9. I docked it a little bit since I found those first few eps a tad slow, and since the drama was only 8 eps, that was a large chunk. But they were important in setting up everything, and then those last five just brought such intensity! This is a drama I would wish could have been like 12 eps because it was so good.